Democrats lined up behind Lt. Gov. 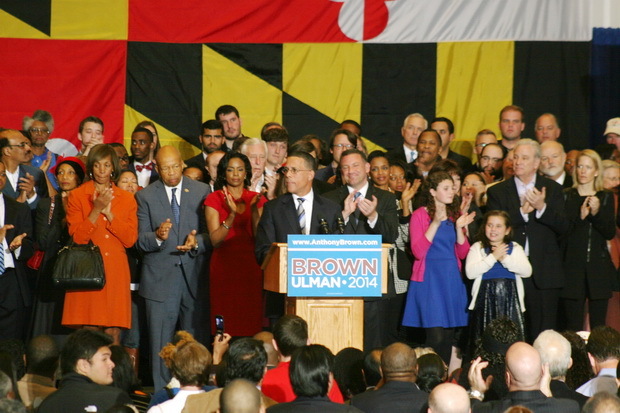 Anthony Brown for support as he gave a brief concession speech in College Park after losing to Republican Larry Hogan, Jr. by five percentage points, 51.5% to 46.8%. Signs that things were not going as Democrats expected surfaced around 10 p.m. when enthusiasm among Brown’s supporters began to wane and staffers were no longer smiling. The crowd of several hundred shrunk to nearly half by 11:30 p.m., a half hour before Brown went on stage. Brown went on to thank his family and “a state and a country” that had given his family so much. Many high profile elected officials were on hand to share the evening with Brown. U.S. House Minority Whip Rep. Steny Hoyer of Maryland’s 5th Congressional district described his mood as “not happy” to reporters when it began to look like Brown was losing. Second District Rep. Dutch Ruppersberger, ranking member of the House Permanent Select Committee on Intelligence, said he thought Brown should have defined himself a little more during the campaign, especially emphasizing his rank as a lieutenant colonel in the military. Ruppersberger said he wasn’t surprised the election was so close or what was going on in the whole country, referring to other races in the mid-term elections. After Brown’s concession speech, the disappointment among many supporters was evident. Montgomery County Councilman Hans Reimer, who successfully ran for re-election Tuesday, said he wasn’t sure a Republican governor would be able to work with the Democrats in the state. “It remains to be seen,” he said unenthusiastically. Taxpayers are paying for a lengthy study that concluded a proposed $15 minimum wage in Montgomery County would lead to fewer jobs, but which businesses participated in the study isn’t being made public.